in far less time and with far less effort! If you've ever tried to make a change in your life and failed to do it, I have great news for you. First conceived of thousands of years ago, this potent technique runs contrary to nearly everything you and I have been taught about the processes of achievement and success. Yet the results (some of which I'll tell you about in a minute) are undeniable. This technique works - better and far more easily than anything else I've ever seen. "...you can sidestep failure to achieve the unthinkable. I'm now tackling some ideas I've long abandoned and am living proof it works. This program is a solid '10'. Don't miss it!" My name is Dr. Robert Maurer. I've spent my entire career helping people bring about positive, healthful changes in their lives: as a clinical psychologist, a faculty member at the UCLA and University of Washington medical schools, and behavioral health instructor at the Canyon Ranch Health Spa in Tucson, Arizona. For years, I toed the usual line with my change-seeking clients. If someone came to me wanting to lose weight or improve his or her health, I encouraged the person to adopt a new diet and a consistent exercise routine. If someone was looking to break out of a career rut, I advised him or her to write out weekly, monthly, annual, and long-range goals, and so on. But when client after client came back to me frustrated, dejected, and overwhelmed with guilt because they hadn't been able to stick to their plan - and had consequently "failed" to achieve what they had set out to do - I began to question the standard approaches to personal change ... and to look for a different way. an extraordinary Japanese principle known as kaizen. Kaizen has been a fundamental part of Asian philosophical systems for ages. Like nearly all such principles, it is streamlined, elegant, deceptively simple - and extremely powerful. When I first found out what kaizen was, I was very skeptical. It was almost impossible to believe that such a system could really produce the kinds of big, far-reaching, long-term results that people were looking for. Then I started reading the stories. Stories of companies like Toyota, which became (and remains) one of the most successful car manufacturers in the world as a direct result of incorporating kaizen into its management practices. Stories of leaders like John Wooden, who systematically applied kaizen techniques throughout his career to become one of the most successful coaches in college basketball history ... and Mother Teresa, for whom kaizen was one of the guiding principles that enabled her to do her great work. Stories of invention after invention - Velcro, bar codes, baby powder, the instant camera, sandpaper, and so many others - that came about not through grand, dramatic planning or marathon brainstorming sessions, but because of kaizen. These stories fascinated me, and they got me thinking: Could kaizen empower my clients and patients to make personal changes in the same way? That question was answered the very first time I tried it. Julie came to the UCLA Medical Center seeking help for her high blood pressure and fatigue. It quickly became apparent, however, that there was a lot more going on. A single mom of two kids, Julie was under a tremendous amount of pressure and stress, which was taking its toll on her physical health - she was 30+ pounds overweight and in serious risk of developing a whole host of problems on top of the ones she came to us with. She was also experiencing depression and, understandably, a feeling of being completely overwhelmed. The physician assigned to Julie's case and I both knew that the solution to just about all of Julie's problems was regular physical exercise. It would help her lose the weight, give her more energy, and improve her spirits. Simple in theory. But this was a woman who barely had enough hours in the day as it was. What were the odds that she would be willing to spend the half an hour a day she had to herself doing something she hated and dreaded? So I changed tactics. Rather than recommending she start jogging five times a week and shipping her off to a nutritionist to receive a radically different diet plan, I suggested a kaizen step instead. When she first heard what it is I wanted her to do, Julie looked at me as if I were crazy. After all, she was expecting to hear that she had to completely upend her life. The thing I was asking her to do took just one minute a day. But she was also intrigued. "I'll try it!" she declared. When Julie arrived for her next visit, she proudly announced that she had stuck with the kaizen step I'd suggested with no problem at all. It was still only taking a minute of her time a day, but I could already see that the transformation had started. Fast-forward several months, and Julie was a totally transformed person. She was exercising daily with enthusiasm and no resistance at all, well on her way to restored health, and best of all, in control of her present and happy and hopeful about the future. She looked different. She was different. All because of kaizen. Patrick was a supervisor who had been charged with soliciting ideas for improving production and cutting costs. After three months of using traditional "motivating" talk to fire up his staff, not only had no feasible ideas been submitted, his staff couldn't stand him, and the number of departmental sick days taken had increased by 23%! But as soon as he began using a kaizen technique instead, the change in his staff's response was dramatic. They instantly warmed up to him; great, usable ideas began pouring in; and sick-day levels quickly plummeted. Grace was a successful, highly competent business woman, but when it came to relationships, her life was a mess. She'd spent years looking for Mr. Right and was in a terrible, unbreakable cycle of burning through relationships, driving men away, and then feeling miserable about it. Yet within six months of applying kaizen, she met the man of her dreams. They've now been married for over five years. Rachel had been a heavy smoker for almost all her life. Chronic respiratory problems had driven her to quit countless times, but she'd never been able to go more than one or two months without giving up and going back to the cigarettes. Then I gave her a shockingly simple kaizen technique to use. Within months (and without even trying!) she'd cut her cigarette intake down by 30%. As of today, she has been 100% smoke-free for more than two years, without even the slightest nicotine craving. Yes, I want to start using the powerful ancient technique of kaizen to achieve my goals and create positive changes in my life in as little as 30 SECONDS a day! Improve your life by setting long-term big-picture goals? Go "cold turkey" in order to quit a bad habit or addiction? Manage your time better by investing in a complicated, detailed day planner? Fix your financial problems by vowing to cut out all excess spending? Overcome a phobia or anxiety by thrusting yourself into the very situation you fear? Lose weight by eliminating all your favorite foods, or an entire food group? These are examples of innovation: taking big, radical steps to achieve change. Sometimes innovation works. And when it does, it's great. But the majority of the time, innovation fails. And the failure of innovation is no accident. Nor is it a matter of weak willpower or lack of discipline - not at all! It's actually simple biology. You see, when you present an innovation (in the form of a large, intimidating goal or dramatic routine change) to your brain, a series of complex neurological processes are set in motion that work against the achievement of change. Innovation triggers the alarm mechanism in the amygdala section of the brain that's known as the fight-or-flight response. More simply put, the thought of change ignites fear. Because the fight-or-flight response is meant to enable you to physically escape danger, it effectively shuts down all nonessential brain functions, including creative thinking. That's great when the source of fear is a dangerous animal or a car careening toward you. You don't want anything to get in the way of your instinct to move. But when the source of fear is something like radically changing your diet, finding a new job, or eliminating tens of thousands of dollars in debt, the instinct to run in the opposite direction is the most counterproductive thing you can do. And yet the instinct to run is all you can connect with! Have you ever felt that tightening in your chest ... that mounting sense of panic and anxiety ... that feeling of being frozen, paralyzed ... when you've thought about a "big thing" you needed to do? It's not just a feeling; it is this complex biological/neurological process at work. In a very real way, you ARE paralyzed! Which is why innovation so often results in failure. The secret to kaizen's power is the fact that it engages the brain in a completely different, much smarter, and infinitely more effective way than innovation does. And by doing so, it is paradoxically able to facilitate the changes that innovation aims to create but so seldom can. Essentially, kaizen disarms the brain's fear response. Instead of activating fear, kaizen "tiptoes" around it, presenting ideas for change in a way that virtually melts the brain's resistance and makes it impossible for it not to do what you want it to do. Soon after you start using kaizen, your brain begins to create new neural pathways: In effect, you develop a whole new mental software that automatically propels you toward the change you seek, without any anxiety or resistance on your part! Without trying, without even really thinking about it, you will automatically take the steps and actions that will get you the results you're looking for. The benefits of kaizen are truly amazing. Once you discover exactly what this profound technique is and start applying it, you'll find that, without even realizing you are doing it, you're creating and maintaining changes you may have considered too difficult or even impossible before. I've watched men and women from all walks of life use the secrets of kaizen to easily, effortlessly achieve the kinds of goals that some people dream of and work toward their entire lives without ever achieving. The list could go on and on because the fact is, there's no limit to what kaizen's power has done or can do. After experiencing and witnessing amazing results like these, I wanted to bring the miraculous power of this simple, foolproof secret to the wider world. That's what I've done in my audio program One Small Step Can Change Your Life: The Kaizen Way to Success. In this mix of dynamic LIVE seminar sessions and intimate studio recordings, I explain exactly what kaizen is and give you a simple step-by-step plan for using it to achieve any change you want to - without fear, and without failure. A word of warning: When you first find out just what kaizen is, you may be shocked. But you won't have to listen long before you become convinced that this simple, elegant technique has the power to change your life in ways that no "revolutionary" system, "radical" plan, or "groundbreaking" method has ever been able to. It's a simple yet profound, ancient yet scientific technique that delivers AMAZING results, every time. I hope you will take this opportunity to discover it for yourself, by ordering your copy of One Small Step Can Change Your Life today! YES, I'm ready to take an entirely unique approach to my personal development. I want to start using the powerful ancient technique of kaizen to achieve my goals and create positive changes in my life in as little as 30 SECONDS a day! 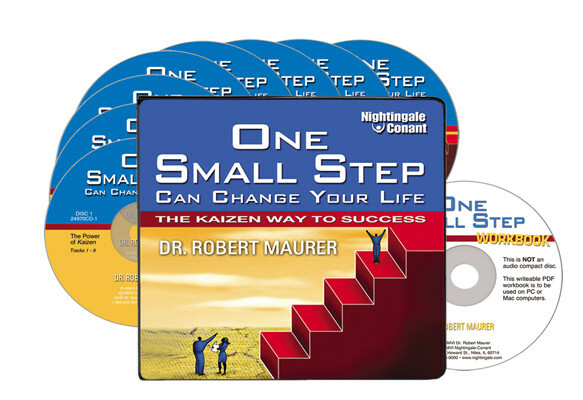 Please send me Dr. Robert Maurer’s One Small Step Can Change Your Life: The Kaizen Way to Success - including 8 CDs plus Workbook - for just $89.95, which is 70% OFF the regular program price. Take advantage of this limited-time special discount now. GUARANTEE: My order today is completely RISK-FREE! If I don't find this program to be life changing, I can return the program any time within 30 DAYS for a full refund of the program price - no questions asked! P.S. We've been programmed to believe that change is a "battle" - something hard fought and hard won, something that demands struggle and sacrifice. But anyone who uses kaizen can tell you that nothing could be further from the truth. With kaizen, change is effortless, simple, and inevitable. How simple is it? Well, do you think you could find 30 spare seconds in your day? That's all you need to begin using kaizen to move quickly and effortlessly toward any life change you want to make. Accept this offer now, and find out what this extraordinary ancient technique is and how it will empower you to achieve your dreams. Not long ago, I started hearing a strange word bouncing around here at Nightingale-Conant. It was cropping up in meetings. People were saying it to each other in the halls. It was peppering our emails. The word was kaizen. And I wanted to know what it meant. When I found out, my first reaction was shock. This was the strategy that was sweeping our company? It seemed impossible. But then I started talking to all the "kaizen-ites" around me, and I discovered something amazing: Kaizen was working! People were creating real, meaningful changes in their lives, things they'd been trying to achieve for years without any success. And, to a person, they swore that nothing had ever been easier. I didn't believe it until I tried it, but once I did, I finally understood what the buzz around here was all about. I've got to say that kaizen just might be the most exciting and powerful strategy for personal change I've ever encountered. It's that different and that effective. Now that Dr. Robert Maurer's wonderful program One Small Step Can Change Your Life: The Kaizen Way to Success is recorded and ready to hear, I urge you to order it as soon as possible so that kaizen can start transforming your life as it has mine. If there is anything in your life you are looking to change - your health, your job, your financial situation, your weight, your relationship, ANYTHING -kaizen is the miracle that's going to empower you to really do it, once and for all. Don't wait another day to find out what it is and what it will do for you! Dr. Robert Maurer is also a behavioral health instructor at the Canyon Ranch Health Spa in Tucson, Arizona, and he is the director of The Science of Excellence, a consulting firm. He travels extensively, presenting seminars and consulting on kaizen to diverse organizations, including corporations, hospital staffs, universities, theater companies, spas - and even the British government. "I highly recommend this program"
"The first time I listened to this program I cried - not like a baby - but in relief of seeing how to do things that intimidate 'everyone' in different ways and have intimidated me. Now I aim to listen and apply its content - I have already asked 'one small question' and thought of 'one small task' to successfully start at things that have in the past just intimidated me. I rate this as the number one program I have had from Nightingale-Conant. It is just feels so doable!" "I've been a Nightingale-Conant customer for two decades and would rate One Small Step... among the most life-changing, logical and well-presented programs I've listened to. Without hype, Dr. Maurer logically explains why most attempts to do something 'grand' fail (it's not what you may think) but how you can sidestep failure to achieve the unthinkable. I'm now tackling some ideas I've long abandoned and am living proof it works. This program is a solid '10'. Don't miss it!" "This is an amazing life-changing program. I own 40+ NC programs, and I would rate this one in the top 5. Dr. Maurer's advice is practical, easy to implement, and solidly rooted in research, not pseudo-science or magical thinking. This program will give you some of the key tools necessary for implementing many of the ideas found in other Nightingale Conant's programs. In fact, it provides important insights into why some of the success activities advocated by masters like Brian Tracy are so effective. I highly recommend this program."